Kelly gave a talk, "Our Supreme Role in the New Evangelization," at Saturday's annual Divine Mercy Conference. Catholics are freaked out by the word "evangelization." But what does that word mean? It simply means sharing the joy of your relationship with Christ. For the New Evangelization to be effective, we have to evangelize heart to heart. We have to show that joy from your heart. It has to be done through relationships. In Matthew 20 [verse 19], Jesus tells His disciples, "Therefore go and make disciples of all nations, baptizing them in the name of the Father and of the Son and of the Holy Spirit." He's commissioning us to go, and He makes it known to us that He is with us, that we do not do this alone. Divine Mercy Weekend in Stockbridge, Mass., kicked off Saturday, April 6, with the Marians' annual Mercy Weekend Conference. More than 200 Marian Helpers from around the country gathered down the hill from the National Shrine of The Divine Mercy to the First Congregational Church — the church once pastored by Jonathan Edwards, the Calvinist preacher famous for his sermon "Sinners in the Hands of an Angry God." Featured speaker Fr. Donald Calloway, MIC, identified himself and the assembled pilgrims as "sinners in the hands of a merciful Father." 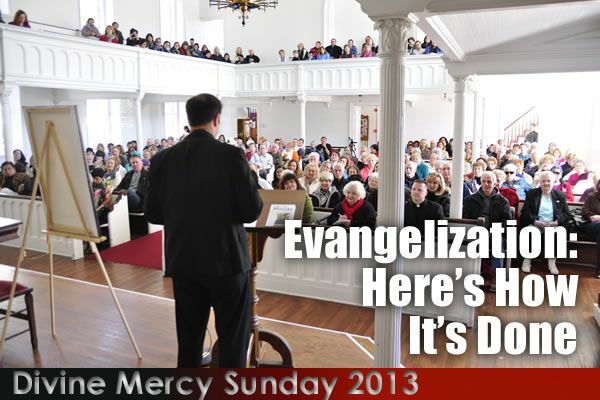 For those sinners, gathered for a conference with the theme, "Divine Mercy and the New Evangelization," the celebration of Divine Mercy Weekend 2013 had begun. Holding up a copy of his newest book, Under the Mantle: Marian Thoughts from a 21st Century Priest (Marian Press, 2013), Fr. Calloway admitted that, while it might be arrogant of him to say so, "This book is awesome!" Yet his words sounded full not of arrogance, but of pure and simple enthusiasm. And enthusiasm, as the day's second speaker, Kelly Wahlquist, would explain, comes from Greek roots meaning, "inspired by God." That is how Father Calloway sounded, from the moment when he began speaking about his book until the final words of his talk, entitled "Our Lady: Masterpiece of Mercy and Mother of the New Evangelization." He did not sound full of himself. He sounded full of the Holy Spirit — full of love for God and His Blessed Mother. Like many who are in love, Fr. Calloway obviously took delight simply in describing his beloved Mary. A creature indeed — "But what a creature!" — Our Lady is God's masterpiece, Father Calloway said. She is "the prototype of what it means to be pleasing to God." She is the heart beating in the Mystical Body of Christ, circulating the life-blood of grace to its members. She is the woman whose heart became a spiritual womb; the sword-thrust it endured on Calvary was the labor pain that gave spiritual birth to the Church. She is the mother whose womb baked for her children the Bread of Life. Father Calloway went so far as to guarantee his listeners that, when someone leaves the Catholic faith or a priest descends into grave sin, "they have fallen away from Mary. ... When you leave Mary, you leave everything." Father Calloway offered this challenge to priests who may hesitate to talk about Mary for fear of aggravating Christian disunity was this: "You'll never have unity in a family unless everyone loves Mama ... Mary is not an option. She is an obligation." Indeed, Father Calloway's talk might be more adequately called a rhapsody, a canticle, a Shakespearean monologue pouring from the heart of a man in love with a lady who, unlike fallen Juliet, can truly be likened to the sun itself. And Father Calloway could serve as an example of the kind of evangelist that Kelly Wahlquist described to the assembly in her talk, "Our Supreme Role in the New Evangelization." So, indeed, could Kelly herself, who is the assistant director of the Evangelization and Development Office for Parish Evangelization for the Association of Marian Helpers. Referring to the burst of light that is believed to have caused the image on the Shroud of Turin, Kelly explained, "We need to be that burst of light that reflects Christ to the world. ... We draw others to Jesus by showing them a light that's so lovely they cannot help but want to know the source of it." Kelly described three crucial tools that the faithful must use in order to be effective evangelists — to fulfill the "supreme duty" that Christ imposed on all His Church when He issued the Great Commission before ascending into Heaven. Those tools are the Holy Spirit, Sacred Scripture, and the Eucharist. If we are to bear that light that will attract souls to Christ, she said, we must call on the Holy Spirit every day, immerse ourselves in the Word of God, and nourish ourselves with the Body of Christ. And just as, according to Father Calloway, God made "the bookends of human history about [Mary]" through the Marian references in the Books of Genesis and Revelation, so did Kelly's concluding words make Mary the "bookends" of the conference. She described Our Lady as "the best model of what it means to evangelize," for after receiving the words of God through the message of Gabriel, she brought it straight to her kinswoman in need, Elizabeth. At the Visitation, Kelly explained, Mary "shares her secret. She shares her heart." So, too, must we share our stories of what the Lord has done for us. "Your soul magnifies the Lord," Kelly said, "when it is filled with joy." Truly, Father Calloway and Kelly Wahlquist, by sharing their stories and their hearts on that Saturday before the Feast of the Divine Mercy, magnified the Lord. As a result, the pilgrims who filed out of the First Congregational Church set out for Eden Hill filled with joy.